READER ALERT! 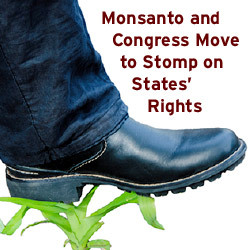 Monsanto and Congress Move to Stomp on States’ GMO Labeling Rights! Posted by John Loeffler in 2013, Agent Orange, amendments, Americans, Consumers, Corruption, cover-ups, covert operations, crops, Deadly, Dirty Politics, Dow Chemical, Environmental Protection Agency, EPA, Farm Bill, Farmers, food supply, Genetic Engineering, Genetically Modified Food, Genetically Modified Organisms, GM Food, GMOs, Greed, Health Hazards, Health problems, herbicides, Human Rights, Human Rights Violations, Lobbyists, Monsanto, Monsanto Protection Act, Occupy Monsanto, poison, Poisoning, Poisonous Chemicals, Politicians, Power Grab, Roundup, Scientific Evidence, Scientists, Toxic, Toxic Chemicals, Toxins, U.S., U.S. Citizens, U.S. Government, U.S. House of Representatives, U.S. Senate, Unconstitutional, United States, violations, Washington, Washington D.C.
2013, Agent Orange, agriculture, Amendments, Americans, Biotech Rider, California, Civil Rights, Congress, consumers, corruption, cover-ups, covert operations, crops, Deadly, dirty politics, Dow Chemical, EPA, EU, European Union, farm bill, farmers, food supply, Genetically modified food, Genetically Modified Organisms, GMO, GMO Ban, GMOs, greed, Grocery Manufacturers Association, Health Problems, herbicides, Human Rights, human rights violations, I-522, Iowa, King Amendment, lobbyists, Monsanto, Monsanto Protection Act, Occupy Monsanto, Organic Consumers Association, poison, power grab, Proposition 37, Rep. Steve King, Roundup, scientific evidence, scientists, Toxic, U.S. citizens, U.S. House of Representatives, U.S. Senate, Unconstitutional, United States Environmental Protection Agency, violations, Washington, Washington D.C. Reliable sources in Washington D.C. have informed the Organic Consumers Association (OCA) that Monsanto has begun secretly lobbying its Congressional allies to attach one or more “Monsanto Riders” or amendments to the 2013 Farm Bill that would preempt or prohibit states from requiring labels on genetically engineered (GE) foods. Let’s put every member of Congress on notice: If you support any Farm Bill amendment that would nullify states’ rights to label genetically modified organisms (GMOs), we’ll vote – or throw – you out of office! On Wednesday, May 15, an amendment to the House version of the Farm Bill, inserted under the guise of protecting interstate commerce, passed out of the House Agricultural Committee. If the King Amendment makes it into the final Farm Bill, it would take away states’ rights to pass laws governing the production or manufacture of any agricultural product, including food and animals raised for food, that is involved in interstate commerce. The amendment was proposed by Rep. Steve King (R-Iowa), largely in response to a California law stating that by 2015, California will allow only eggs to be sold from hens housed in cages specified by California. But policy analysts emphasize that the amendment, broadly and ambiguously written, could be used to prohibit or preempt any state GMO labeling or food safety law. Will the King Amendment survive the Senate? No one can be sure, say analysts. However few doubt that Monsanto will give up. We can expect that more amendments and riders will be introduced into the Farm Bill–even if the King Amendment fails—over the next month in an attempt to stop the wave of state GMO labeling laws and initiatives moving forward in states like Washington, Vermont, Maine, Connecticut and others. If Monsanto can’t stop states from passing laws, then the next step is a national preemptive measure. And all signs point to just such a power grab. Earlier this year, Monsanto slipped its extremely unpopular “Monsanto Protection Act,” an act that gives biotech immunity from federal prosecution for planting illegally approved GE crops, into the 2013 Federal Appropriations Bill. During the June 2012 Farm Bill debate, 73 U.S. Senators voted against the right of states to pass mandatory GE food labeling laws. Emboldened by these votes, and now the House Ag Committee’s vote on the King Amendment, Monsanto has every reason to believe Congress would support a potential nullification of states’ rights to label. The million-strong OCA and its allies in the organic and natural health movement are warning incumbent Senators and House members, Democrats and Republicans alike, that thousands of health and environmental-minded constituents in their Congressional districts or states will work to recall them or drive them out of office if they fail to heed the will of the people and to respect the time-honored traditions of shared state sovereignty over food labels, food safety laws, and consumers’ right to know. Yet despite their marketplace dominance, record profits and enormous political clout in Washington D.C., Monsanto and the biotech industry are in deep trouble. Evidence is mounting that Monsanto’s top-selling herbicide, Roundup, is a deadly poison, destroying important human gut bacteria and likely contributing to the rapid increase of food allergies and serious human diseases including cancer, autism, neurological disorders , Attention Deficit Hyperactive Disorder (ADHD), dementia, Alzheimer’s, schizophrenia and bipolar disorder. Those most susceptible to poisoning by Monsanto’s Roundup are children and the elderly. Scientists aren’t the only ones raising new questions about Roundup. Farmers are complaining that they’re being forced to spray more and more chemicals on crops increasingly under siege from a growing army of herbicide-resistant weeds. The situation is so bad that the U.S. Environmental Protection Agency (EPA) just raised the limits of Roundup residue allowed on grains and vegetables to even more dangerous levels. But just in case the EPA someday stops raising the limits, Monsanto, Dow and the biotech industry are working on a new “solution” to the onslaught of herbicide-resistant Superweeds: They’ve applied for approval of a new and highly controversial generation of super toxic herbicide-resistant GE crops, including “Agent Orange” (2,4-D and dicamba-resistant) corn, soybeans and cotton. Monsanto’s greatest fear isn’t a federal government charged with protecting the health and safety of its citizens. Congress and the White House seem only too happy to oblige the biotech industry’s unquenchable thirst for growth, power and dominance. No, it’s the massive, unstoppable (so far) grassroots movement of Millions Against Monsanto that strikes fear in the heart of the Biotech Bully. U.S. citizens are waking up. They’re demanding labels on genetically engineered foods, similar to those already required in the European Union. They’re calling for serious independent safety-testing of GE crops and animals, both those already approved (especially Monsanto’s Roundup-resistant crops) and those awaiting approval. The anti-GMO movement has finally figured out, after 20 years of fruitlessly lobbying Congress, the FDA and the White House, that the federal government is not going to require labels on GE foods. Instead the movement has shifted the battleground on GMO labeling from Monsanto and Big Food’s turf in Washington D.C. to the more favorable terrain of state ballot initiatives and state legislative action—publicizing the fact that a state GMO labeling law will have the same marketplace impact as a national labeling law. State laws spell doom for Monsanto. Companies like Kellogg’s, General Mills, Coca-Cola, Pepsi/Frito-Lay, Dean Foods, Unilever, Con-Agra, Safeway, Wal-Mart and Smuckers are not going to label in just one or two states. Monsanto knows that U.S. food companies will go GMO-free in the entire U.S., rather than admit to consumers that their products contain GMOs. As Monsanto itself has pointed out, labels on genetically engineered foods are like putting a “skull and crossbones” on food packages. This is why Monsanto and their allies poured $46 million into defeating a California ballot initiative last year that would have required labels on GMO foods. This is why Monsanto has lobbied strenuously in 30 states this year to prevent, or at least delay, state mandatory labeling laws from being passed. This is why Monsanto has threatened to file federal lawsuits against Vermont, Connecticut, Maine and Washington if they dare grant citizens the right to know whether or not their food has been genetically engineered or not. And this is why Monsanto’s minions are trying to insert amendments or riders into the Farm Bill that will make it nearly impossible, even illegal, for states to pass GMO labeling laws. And there’s nothing to stop them when Congress is filled with pro-biotech cheerleaders who could care less that 90 percent of U.S. consumers want mandatory labels and proper safety testing of genetically engineered crops and foods. Countering Monsanto’s Final Offensive: Throw the Bums Out! It’s time we exercise the full power of direct democracy, not just state and municipal ballot initiatives. We must continue to support efforts like the current state ballot initiative to label GMOs in Washington state, and county ballot initiatives to ban GMOs, factory farms and other corporate crimes, in the 24 states and hundreds of counties and municipalities where these are allowed. But we also need to use the power we have to recall and throw out of office our out-of-control Congressional Senators and Representatives as well. If our elected officials in Congress continue to represent Monsanto and big corporations, rather than their constituents, then let’s throw the bums out! If the Washington political Establishment, both Democrats and Republicans, continue to trample on our inalienable constitutional rights and contemptuously disregard the 225-year principle of a shared balance of power between the federal government, the states and local government, then we have no choice but to recall them or throw them out of office. Please join the nation’s organic consumers and natural health advocates in this strategic battle, the Food Fight of Our Lives. Please join this campaign to save, not only our right to choose what’s in our food, but our basic right to democratic representation and self-determination as well. Tell your Congressmen and women, especially the 73 incumbents who voted last year to eliminate states rights’ to legislate on GMO labels, and those in the House this week who voted to support the King Amendment that “enough is enough!” Power to the People!